Calcium imaging in awake mice. Neurons were labelled with GCamP6-Ruby. 2-photon calcium imaging is the technique of choice to identify how spatially distributed microcircuits contribute to synchronization in the brain. By using LaVision BioTec’s 2-photon TriM Scope microscope with the 64 Beam Option or the resonant scanner, functional network structures in brain slices and living mice can be observed with single-cell resolution. To detect e.g. calcium signals in brain slices, these have to be loaded with a suitable calcium indicator like Fura-2 that reflects the neuronal activity by changing its fluorescent properties upon Ca2+ binding. By recording movies over a sufficient time range, changes in the fluorescent intensities of single neurons are recorded. Thereby, the 2-photon technique allows imaging deep in the tissue with reduced photo-damage and photo-bleaching. To detect single action potentials with a high time-resolution in brain slices, the 64 Beam Option in combination with the TriM Scope II is a suitable option. A beam splitter divides one laser beam into 64 individual beams that are scanned simultaneously over the sample. The fluorescence signal is then detected by a fast camera that allows imaging an entire field with a high number of neurons at once. By recording movies over several minutes, the calcium dynamics of each neuron are detected. Afterwards, the calcium signals can be analyzed and compared with action potentials. 2-photon calcium imaging combined with the 64 Beam Option provides not only a dynamic and global picture of the brain network but also the observation of single neurons and their activities . Another application in the field of networks and their function and integrity is the observation of calcium transients associated to neural spiking in neurodegenerative diseases. For observing calcium signals deep in the brain of living animals, the TriM Scope II in combination with the resonant scanner is the best choice. One beam scans at high speed (30 frames/sec with 512x512 pixel resolution) over the sample and the fluorescence signal is detected by sensitive photomultiplier tubes (PMTs). With a calcium indicator like the synthetic Oregon-Green Bapta-1 or GCamP6, the activity of a local microcircuit deep in the mouse brain can be recorded. To inject the calcium indicator into the mouse brain, the multicell bolus loading technique provides good results . 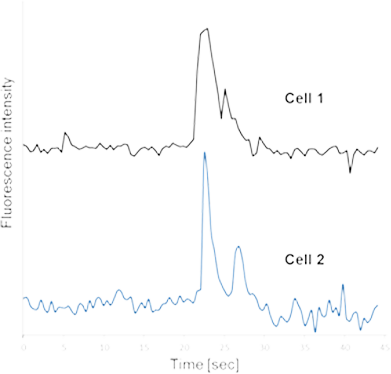 The calcium signals of single neurons are then observed with the 2-photon microscope and can be analyzed and correlated with action potentials afterwards. This experiment allows the identification of networks and to understand the role of diverse proteins and their behavior in a disease. Imaging the calcium signals of the same cells over months allows correlation of the activities of cells with the course of neurodegenerative diseases. Both LaVision Biotec products, the 64 Beam Option and the resonant scanner, can be used to detect calcium transients in neuronal networks. the resonant scanner is the better choice whereas the 64 Beam Option provides a higher temporal resolution for measurements in brain slices. In addition, beam multiplexing reduces photo-damage and therefore, the 64 Beam Option is the more moderate method. However, the TriM Scope II setup can be equipped with both options: the resonant scanner and the 64 beam multiplexer. By a single switch, users can choose the best method for their application. The use of calcium indicators enables scientists to monitor the activity of microcircuits at cellular resolution and, in combination with optogenetic tools, to investigate the functional impact of neurons on a specific process in the brain. To combine both experiments, two different fluorescent species have to be injected into the sample: e.g. Channelrhodopsin ChR2 that absorbs light in the blue range (~480nm) for optogenetic modulation and a calcium indicator like GCaMP6 for 2-photon calcium imaging (excitation wavelength ~930nm). By using the TriM Scope II with the resonant scanner, fast calcium signals and thereby fast changes in the activities of neurons can be imaged through a window in the mouse skull. Independent from the imaging pathway (e.g. excitation by Ti:Sapphire or OPO), the optogenetic pathway with a blue laser line is integrated into the TriM Scope II via a second galvanometric scanner (the treatment scanner). This setup configuration allows the imaging of calcium signals with high speed resonant scanning while performing spatio-temporally independent optogenetic modulation with the treatment scanner. Because of the high intensity laser beams in the visible range used for optogenetic experiments, it can be challenging to couple optogenetic stimulation and calcium imaging in the mouse brain. As a solution, calcium indicators and opsins that are both excitable with a 2-photon laser and whose absorption spectra do not overlap can be used. As an example, the opsin C1V1 (a chimeric, red-shifted channelrhodopsin) could be injected for optogenetic modulation and the indicator Oregon Green Bapta-1 for calcium imaging. Then, C1V1 can be modulated with a wavelength between 1100 nm and 1300 nm by an OPO and Oregon Green Bapta-1 can be excited using a 800 nm Ti:Sapphire laser beam. Using this configuration, excitation cross-talk during simultaneous excitation with both laser beams is negligible. This is realized within the TriM Scope II microscope by an independent OPO beam path (via the treatment scanner) and a Ti:Sapphire beam path (via the resonant scanner). This enables simultaneous optogenetic modulation of C1C1 and high-speed calcium imaging of Oregon Green Bapta-1. Thus, the effect of single neuron excitation on the activity of a microcircuit can be observed with single-cell resolution.